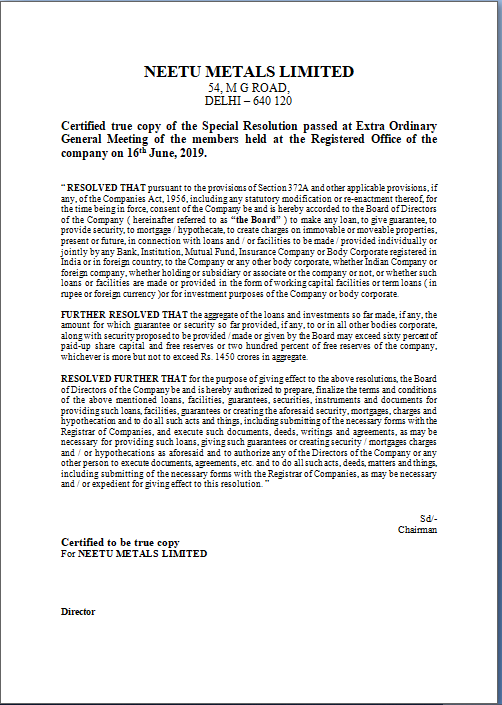 Certified true copy of the Special Resolution passed at Extra Ordinary General Meeting of the members held at the Registered Office of the company on 16th June, 2019. “ RESOLVED THAT pursuant to the provisions of Section 372A and other applicable provisions, if any, of the Companies Act, 1956, including any statutory modification or re-enactment thereof, for the time being in force, consent of the Company be and is hereby accorded to the Board of Directors of the Company ( hereinafter referred to as “the Board” ) to make any loan, to give guarantee, to provide security, to mortgage / hypothecate, to create charges on immovable or moveable properties, present or future, in connection with loans and / or facilities to be made / provided individually or jointly by any Bank, Institution, Mutual Fund, Insurance Company or Body Corporate registered in India or in foreign country, to the Company or any other body corporate, whether Indian Company or foreign company, whether holding or subsidiary or associate or the company or not, or whether such loans or facilities are made or provided in the form of working capital facilities or term loans ( in rupee or foreign currency )or for investment purposes of the Company or body corporate. FURTHER RESOLVED THAT the aggregate of the loans and investments so far made, if any, the amount for which guarantee or security so far provided, if any, to or in all other bodies corporate, along with security proposed to be provided / made or given by the Board may exceed sixty percent of paid-up share capital and free reserves or two hundred percent of free reserves of the company, whichever is more but not to exceed Rs. 1450 crores in aggregate.